Available at Amazon.com, Amazon.ca, ChristianBook.com and Barnes and Noble. She was a home-schooled pastor’s daughter who wasn’t allowed to play with Barbies or dance. Her mum made sure there would be nothing that could tempt her daughter to be vain, or to contract an eating disorder. So she went ahead and got one anyway. At the age of nine, Emily Wierenga began to restrict her food intake, and by the time she was 13, she was so severely anorexic nurses were surprised she was still alive. Chasing Silhouettes: How to Help a Loved One Battling an Eating Disorder is the story of a broken family that finds healing through an eating disorder. It’s the story of how even good Christians need redemption, and how eating disorders pervade all homes—even the seemingly perfect ones. A unique resource, it addresses the whole of the illness: physical, mental, emotional and spiritual, providing shocking insight into the disordered eater’s mind that no other book will offer. In addition to a stirring personal narrative, Chasing Silhouettes is comprised of advice from some of the nation’s top eating disorder experts, sample prayers for when yours run out, as well as stories of others who’ve battled—and overcome—eating disorders. 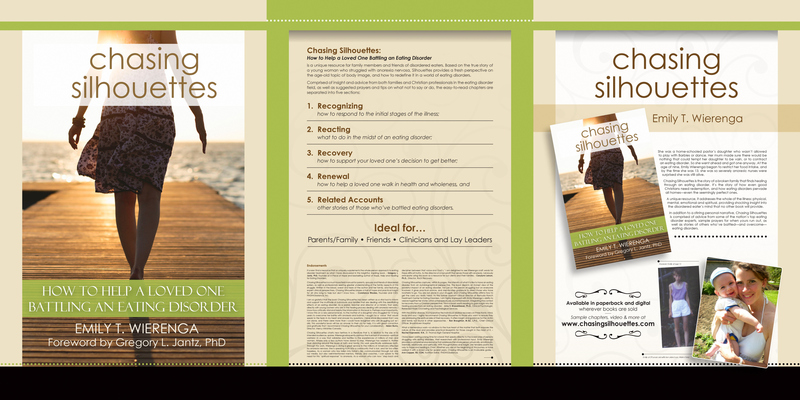 Chasing Silhouettes is a unique resource for family members and friends of disordered eaters. Based on the true story of a young woman who struggled with anorexia nervosa (Emily Wierenga), Chasing Silhouettes provides a fresh perspective on the age-old topic of body image, and how to redefine it in a world of eating disorders. 5. Related Accounts–other stories of those who’ve battled eating disorders. For more information, view Project Background here.